If you have a DSLR (Digital Single Lens Reflex) stills camera that is only a few years old, it may well shoot video. Also referred to as HDSLR (High Definition Single Lens Reflex), it may well shoot better looking video than an expensive video camera. The BBC, Hollywood and American mainstream media have been using them for some time and they are well suited to drama where some of their shortcomings are less of a problem. They can however, be used very successfully for documentaries. They can shoot great looking interviews and are even of some use for on the hoof 'run and gun' work. The video below is an example of what can be achieved. It was shot on a Canon 550D with a £7 neck tripod and a £50 LCDVF (an eyepiece similar to the one shown above) and the total cost of setup was around £500. This was the first time I have used a DSLR in anger! There are a couple of slightly wobbly shots and I think a rig of the type shown above would help a lot (these are discussed below). This beginners guide to DSLR video should get you started, outline the 'pros and cons' and set you in the right direction. For more information, you may also want to look at Rough Guide to Filming which is a general guide to shooting. So what's so great about DSLRs? The footage they produce looks great. I have a Sony Z1 (£2000) and the stuff I have shot on a Canon 550D (£500) looks as good if not better. The colours are vivid and the depth of field is nice and shallow (see Depth of Field section). They are good in low light The reason for this is that they have a very big sensor (the bit that the light hits; where the film used to be), which is around 2 to 4 times bigger than entry level pro video cameras. They are small and unobtrusive. They are easy to carry but more importantly you can film without people realising. People are more self conscious when being filmed than photographed. Also some places will not let you take a video camera but will let you take a 'stills camera'. They are very cheap A DSLR with a few bits and bobs costing £500 can produce footage as good as a £20,000 video camera. They use still camera lenses This is another thing that makes them cheap (although they have their problems). Stills lenses are a lot cheaper than specialist video ones. 3rd party firmware hacks can give you facilities and frame-rates only available on the most expensive cameras and/or new facilities not available at all. There are video cameras coming along with DSLR sensors (often refereed to as CMOS/Crouped Frame sensors) and these can give the best of both worlds but are still currently expensive (£3000+ not including a lens). The ergonomics are wrong and holding the camera steady is a problem but if you are using a tripod or support you can overcome that (see getting a steady shot section). Zooming during a shot is virtually impossible (with standard DSLR lenses and no extra kit). To be able to zoom firstly you need expensive 'single F stop' lenses. This is because if the aperture changes during a zoom you will see the light level suddenly change (as the aperture changes). All but the top end zoom lenses for stills cameras change the aperture while zooming. Also for stills cameras to go from max wide to max zoom you don't have to rotate the lens much (i.e 1/4 of a turn). This makes it near on impossible to do a smooth zoom (also the lenses are not designed for smooth zoom so they can be a little sticky/jumpy). Video Camera lenses usually have something like a full turn and are designed with a smooth mechanism. It is possible to buy very expensive 'video' lenses but they are expensive. No back focus. This means you can not zoom in, focus and then zoom out to the shot you want (keeping the focus) . This is the generally how to focus when using professional video cameras; you do not have to change focus when zooming (they hold focus). No professional XLR microphone sockets or phantom power. DSLRs which have microphone sockets have a 3.5mm mini-jack which is not ideal (XLR inputs are generality used for professional recording). A camera mounted preamp can be used but sound should ideally be recorded separately. There is no viewfinder and the screen it small and often fixed. Your DSLR may not have a transitional eyepiece viewfinder so you are reliant on the small LCD fixed to the back of the camera. This is sometimes articulated so can be moved but it can be difficult to see in bright sunlight. Camcorders generally have an articulated LCD viewfinder to use for framing/focusing which work in bright light. Having to be directly behind the camera is often not convenient (both LCDs and viewfinders tend to have various positions so you can, for example, be above the camera when filming). A bolt on LCD/viewfinder can be used to overcome this. The LCD monitor is generally inadequate for focusing and cameras do not have focus assist (i.e. no peaking). I,ve found this to be the case for Canon and I believe later Panasonic Lumix models and the Sony Alpha are better than Canon. Again, a bolt on LCD/viewfinder is used to solve this problem. No Zebras. In mid and top level camcorders you can set up a zebra pattern which appears in over exposed areas. These are not supported in DSLRs but firmware hacks available for some DSLR cameras have these. Magiclantern software has 'under' and 'over' exposure zebras (red for over, blue for under). limit to the maximum length of a single shot. For Canon this is 12 minutes. This is because the camera would overheat. Panasonic Lumix does not have a limit. 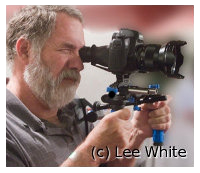 Realtime focus DSLR cameras are designed to focus while the mirror is down and you are looking through the viewfinder. While in video mode the mirror is constantly up and the LCD is used. This means a secondary autofocus system is used when shooting video. Autofocus in DSLRs tends to be slow and noisy and hunts a lot (overshoots and them comes back). This means it is not possible to use autofocus and manual focus must be used. Some don't have a microphone socket so sound must be recorded separately. Drama tends to record sound separately anyway but for documentary work this can be very inconvenient. Some don't have a headphone socket so you cant monitor sound through headphones (which is essential). This means you would have to record sound separately. There are three issues you are trying to solve here. The options for sound are to record it separately or get a camera mounted mixer/amplifier. The latter will do in some situations where sound is less of an issue, but getting a sound recordist to record the sound separately is the best option. Although this requires more coordination when filming and there is then the need to sync all the audio and video for editing, this is definitely preferable to trying to edit with poor quality audio. The solutions for recording sound separately while using DSLR are the same as recording with any film camera. For years, DAT was used, followed by hard disk systems. Recently there has been a move to solid state recorders which record on SD cards. Prices vary, but Zoom do a range which include the budget Zoom H1 and the more professional Zoom H4n (pictured right) which has balanced XLR inputs. Other ones to consider are the Edirol R-06 (pictured left) and the Sony M10 (which is probably one of the best with 3.5mm jack inputs). To get clean sound you will want to use a boom mic and lavalier for interviews and you can also get very good results using the internal microphones for ambient and wild-track. The best option is always to record the sound using external microphone(s) which are plugged into a mixer which is controlled by the sound engineer. The output from the mixer can either be recorded separately (as above) or recorded on the camera (see next section). Using a camera mounted mixer/amplifier. Several people (Beachtek and Juicelink) have created units specifically to overcome the problems of recording sound on a DSLR. They have an amplifier so the internal amplifiers in the cameras can be turned off. They have circuitry that causes the Auto Gain Control to be turned to minimum. They also have manual levels and a headphone socket to allow the audio to be monitored. Jucelink do a budget, but high quality, unit (DS214, pictured left) which is designed for use with 3.5mm mini-jack Microphones such as the Rode VideoMic. They do a full range that includes XLR and phantom powered models and even a 4 channel one. Beachtek also do a full range which take both XLR and minijack. The Jucelink with XLR and phantom power (DT454) is quite a lot more expensive than the Beachtek Equivalent (DXA-SLR, pictured right) but you should look at both and see if there are any other ones around. Be sure the model you choose has all the features you need; for instance, some of the Jukelink models do not have a headphone output. If you turn off the internal pre amps (the camera may have this feature or you may need to use hacked firmware), it may be possible to connect some microphones directly to the camera if they put out a line level signal (i.e. Sennheiser radio microphones). You may not be able to monitor the sound. Alternatively a external mixing desk will put out a high enough signal to record on to the camera with pre-amps turned off (but then, if you have a sound engineer and portable mixer available, you probably want to record sound separately anyway! ).